Sharon and I are loving this camp out. RV camping at the ocean is a terrific experience. Last night the campfire made the evening even better. Dinner was a steak cooked on the camp fire. Afterward talking with our RV.net friends and watching the stars overhead enhanced the night. WOW! It is nice to get away from the city and see so many stars. One super bright star reflected on the ocean. Imagine the moon reflecting on water. This single star did the same thing, only not quite as bright as the moon. It was amazing. We bought a couple of “clamp on the table” metal Tiki Torches. Just two torches sure add a lot of light to the campsite. We also have a modern copy of of an old kerosene highway flare. It is a little round pot with a wick that burns Tiki fuel. Between those three lights and the campfire, our campsite has plenty of light. 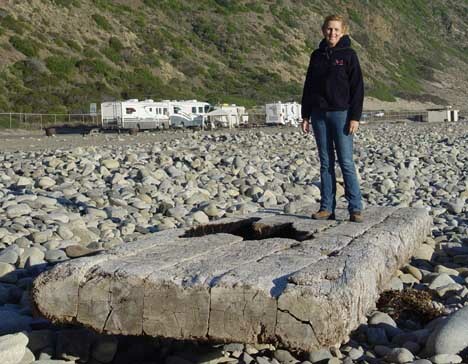 There is a huge “raft” washed up on shore. It is made of five 12 inch beams. It is about 15 to 20 feet long. What huge thing to be floating on the ocean. Can you imagine a fast boat hitting that thing? I imagine it might even to damage to a big ship.